Season 3 of the fishing show, Local Knowledge, started off with a trip to the Great Barrier Reef with Nomad Sportfishing on April 8, 2018, at 8 AM EST & PST on the Discovery Channel. In this first episode of Season 3, Ali can’t pass up an opportunity for a trip of a lifetime to jig and pop the remotest areas of the Great Barrier Reef with Nomad Sport fishing. Meanwhile his counterpart Rush stays home to clean up from Hurricane Irma which slammed his hometown in the Florida Keys. He also is busy keeping tabs and making plans on the new boat build at Andros Boatworks. The journey to get to the remotest parts of the Great Barrier Reef is an adventure in itself. 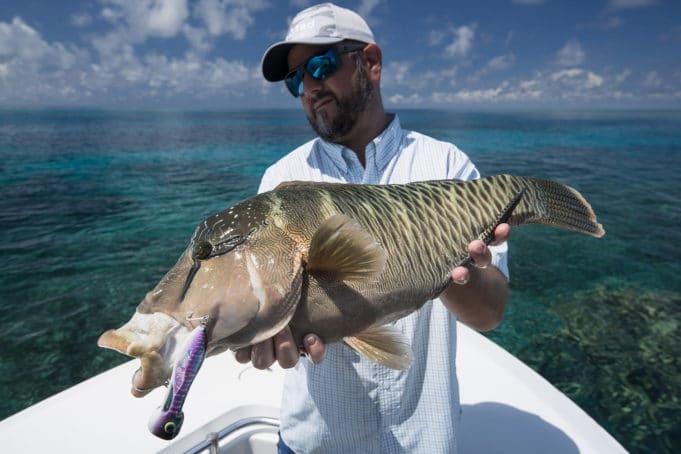 Upon arrival, Ali experienced some of the best fishing of his life and never saw another boat during their time exploring the shallow coral heads for a huge variety of lure-crushing gamefish. The first new episode of Local Knowledge aired 8 AM EST & PST on Discovery Channel on Sunday April 8th. You can also watch previous and current episodes of Local Knowledge on Youtube and a wide variety of viewing platforms.